Focus: Understanding Economics in U.S. History uses a unique mystery-solving approach to teach U.S. economic history to your high school students. Sure to capture the attention of your inquisitive and energetic students, these activity-based lessons give you a new, refreshing way to meet your U.S. History content goals, and infuse eye-opening economics material at the same time. Why did the 13 American colonies prosper, when they had little to offer economically? Is education beyond high school worth the cost? Why did the economy grow during the 1920's, but falter during the 1930's? Did the New Deal help, or hurt, economic recovery? Why did the post-World War II years bring unprecedented prosperity and expansion to the American middle class? When you turn your students into U.S. History sleuths, you'll immediately capture their attention and unleash a new wave of creativity in your classroom. 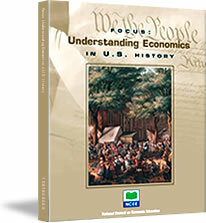 The publication of Focus: Understanding Economics in U.S. History and this Web site were made possible through funding from the Calvin K. Kazanjian Economics Foundation.